Sustainable and Responsible Investing is a global trend that has picked up momentum in the last 10 years; and India is likely to be the next frontier. This is the finding of a recent research carried out by Oxfam and cKinetics that studied 24 Asset Management Companies, 145 funds and engaged over 35 stakeholders. What is Sustainable and Responsible Investing? Sustainable and Responsible Investing (SRI) considers performance of a company with respect to its natural capital and environment (E), its interaction with the society, consumers, employees (S) and measures policies and processes of the company and management of stakeholder interests (G) to make better informed decisions. Investors are incorporating ‘ESG’ information in their financial decision-making process to have a holistic view of the companies they intend to invest in. This in-turn is getting companies who are seeking capital from such investors (who have subscribed to an SRI outlook) to be more conscious of the ecosystem in which they operate. The Oxfam-cKinetics report titled ‘Drops before the Rain’, estimates the present capital deployed with Sustainable and Responsible strategies in India to be ~$30 billion (₹1,962 billion). This contrasts with $13 billion (₹1,962 billion) 5 years ago that was estimated by cKinetics’ Cracking the Conundrum. 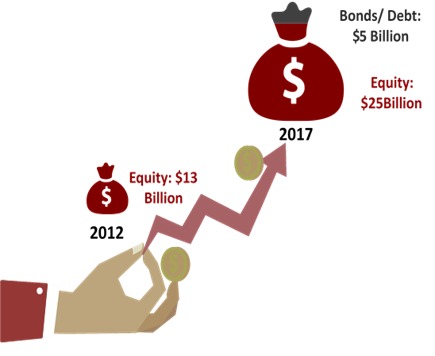 This capital pool however, pales in size with the global pool of capital deployed with SRI strategies. 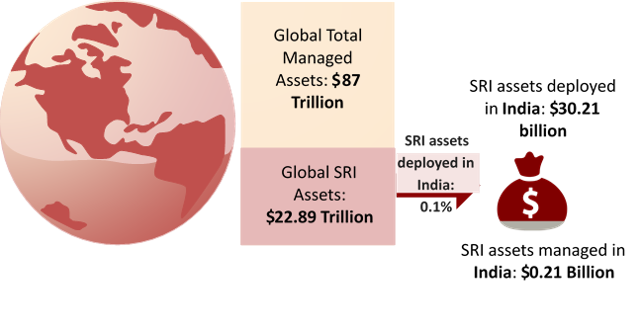 Assets managed and deployed with Sustainable and Responsible Investing strategies totals $22.89 trillion (₹1476 trillion) globally. Increasingly ESG (Environmental-Social-Governance) information is being incorporated along with financial analysis in decision making. 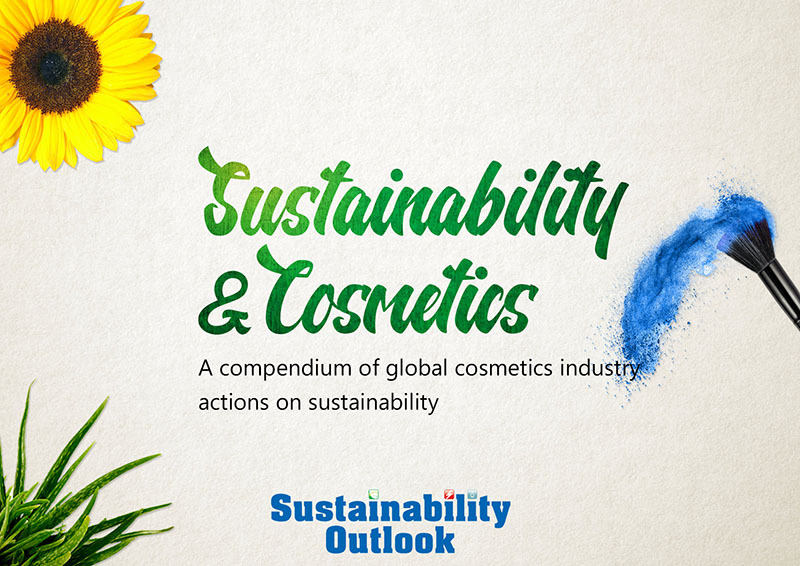 In fact, the Global Sustainability Investment Alliance estimates almost 26.3% of the global capital under management is arguably driven by such strategies; and this number has been growing at an annual rate of 20%. Worldwide SRI has either been driven by a policy push or by investors asking for it. In India, the Business Responsibility Report (BRR) is a key enabling requirement placed by the Securities and Exchange Board of India (SEBI) on the 500 largest listed companies. And while, retail investors are yet to ask for SRI in India, more global financial institutions are asking for it as they engage Indian businesses. The benefits of acting on ESG factors is high for companies; and the corresponding cost of inaction is an increasingly high risk for investors (and companies). This is especially true in India where awareness is increasing among the populace and the social license to operate is something that companies need to consider. Indian firms are already disclosing information as per the required Business Responsibility Report. This enabling disclosure policy has created a framework for companies to engage in dialogue with their stakeholders. The BRR is also a tool that most investors interviewed in this report are familiar with. As companies improve their BRR reporting, asset managers using SRI strategies will leverage it. There are increasing sectoral themes that one can invest in using SRI principles- both on the equities and the bond side (which have been elaborated earlier in this study). Specialized investment opportunities are emerging in India – related to renewables, investing in water-infrastructure, etc. Document Tag: ESG finance Sustainable and Responsible Investing report India Drops before the Rain?